This easy smoked salmon and cream cheese finger sandwich recipe is a quick and easy addition to any afternoon tea party or light lunch. The recipe makes enough sandwiches for a crowd, when served with other offerings, or for six to 10 people with a few portions each. This recipe uses buttermilk white bread, but if you want to go a more traditional route, consider using pumpernickel bread. You can also substitute whole wheat bread or even your favorite gluten-free bread. Another variation that you will see is to serve these open-faced. You can also substitute dill for the parsley or use smoked paprika. Smoked salmon is a good source of omega-3 fatty acids, which have cardiovascular health benefits. These little sandwiches can be a fun way of including salmon in your diet. However, be aware that cold-smoked salmon is high in sodium. Spread all slices of bread evenly with cream cheese. Cover one side of the sandwich with slices of salmon. These sandwiches are best made close to the time when they will be served. While you can refrigerate them for a couple of hours, the bread can begin to dry out and they won't be as satisfying. If you are preparing in advance, place them closely together layered on a sheet pan and wrap well with plastic wrap to retain the moisture. You can set these out with other types of finger sandwiches on a tea tray or tiered stand. 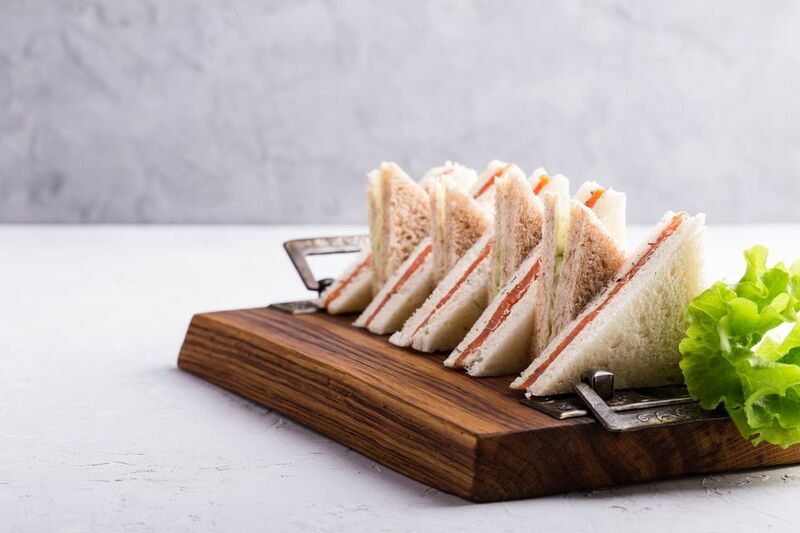 If you are serving your guests individually, artfully arrange the plate with alternating some of the sandwiches with the tips up while others rest at right angles. If you want to serve a traditional afternoon tea menu, include finger sandwiches with scones, marmalade, lemon curds, and herbed butter. The favorite teas to serve include black teas like Earl Grey and Assam. Be sure to ask your guest for preferences, as some may want herbal teas like chamomile and mint.